Home» Road Tests » Vauxhall Movano Contract Hire & Leasing Review. We supply stacks of vans, because we are one of the Contract Hire & Leasing company’s that specialise in that area, and we are used to them, but despite the number we supply and despite the amount we test drive, its not often we write a road-test report on them, so here goes, the mould if not being broken, is now cracked, as we give you our impressions on Vauxhalls, it has to be said, rather attractive Movano. Vauxhall were kind enough to loan us what known as an L3 H2 and that means its long wheelbase with a standard roof height. This kind of model designation is now being used by many van makers, with “L” designating the length of the van, so L1 means short wheelbase, L2 meaning medium wheelbase, L3 you’ve guessed it, long wheelbase and L4, a little more tricky as extra long wheelbase. Same principal for “H” as that’s the roof height with H1 being low roof, H2 being standard roof and H3 being high roof. In addition to having it as a normal panel van, you can also get Movano as a 7 seat double-cab, chassis cab, crew cab or platform cab so you can pretty much build what ever bespoke body you wish, enabling the Movano to play what ever role you need it to. Our van had a GVW of 3500kg, although Movano is available in a choice of three different GVW’s which are 3300 / 3500 & 4500kg. You’ve then got another choice and that’s if you go for front wheel drive or rear wheel drive and I guess that decision depends on what you are going to use the van for. Certainly in terms of numbers we supply, front wheel drive with its lower loading rear loading height has been far more popular with our customers. Movano is available with three different engines, although that’s not strictly true as the engines are all the same 2.3ltr 16v units, but available with different power outputs which are 100ps, 125ps and 146ps. Six speed manual transmissions are standard, but on certain variants, you can specify a “Techshift” which is a hydraulic transmission that offers all the benefits of an ordinary automatic gearbox, but can also be driven as a manual, with the driver changing gears, although because it’s got an automatic clutch, there isn’t a clutch pedal. It would be easy at this point to say “well it’s just a van” but in fact, a van has to do all that a car would and lots more. Drivers of vans spend ages behind the wheel, often much more time than a car driver would and of course, they are driving something that’s often over double the weight of your average car, so steering, braking, cornering are all hugely important and again, I would say that unless you are driving like an idiot, the way a van does what it does, is more important than the way a car does its thing. OK, first impressions, it’s big very big and your mind immediately strays to wondering how your going to get it out of the gap where the delivery driver parked it. From there on in, its thinking about where your going to park it at home, or at the local supermarket and the whole experience turns into a military mission rather than something a car driver would do on auto-pilot. This does however make you think a little about white van man and the problems he’s going to encounter during his average day and you begin to feel a little guilty that you carved him up in traffic or wouldn’t let him out of a junction and its probably true what they say, to fully understand someone’s problems, you should walk a mile in their shoes and I think that applies here, as after our test period, I certainly feel a little warmer to the guy in the white van beside me in traffic. Hopping in, or rather climbing up into the Movano’s cabin you are pleasantly surprised by what greets you, as it’s all rather civilised, rather car like, on a grander scale. The seats are nice and infinitely adjustable as is the Movano’s steering wheel, ensuring you can get ‘proper-comfy’ before you set off. The Movano’s middle seat even folds flat so that you can use it as a work surface and so that you don’t get dehydrated, there’s also a couple of drinks holders built into the seat back. The Movano’s audio system was the first thing we decided to play with and whilst its very unassuming, it does have steering column controls and you can pair you mobile phone up to make and receive calls hands free and I can tell you, the hands-free system worked faultlessly and the call quality was fabulous (see, I am started to get excited about a van) and on finding the van also had cruise control, well, I was nearly overcome! The next thing you notice is the amount of places to put things, there are stacks of pockets, in the doors, on the dash, over your head, simply loads and I would imagine if you were the regular driver of this van, you would have endless hours of fun, finding things to take out with you, as the Movano has space for all your favourite toys. The Movano’s controls are well laid out and easy to use and feel pretty substantial and you would imagine, be likely to still be working 100,000 miles down the road. Instrumentation is clear and concise and easy to read and for those of you plug-in freaks, the Movano has two 12v sockets in the cab and you can order a third one in the load area if needs be. Our van also had a couple of phono-plug outlets on the dashboard to allow you to plug in an MP3 player or similar and whilst that’s a really good idea, they did look kind-of out of place on the dash, more like they should be on a 80’s stereo system (still very small point, shouldn’t of mentioned it). 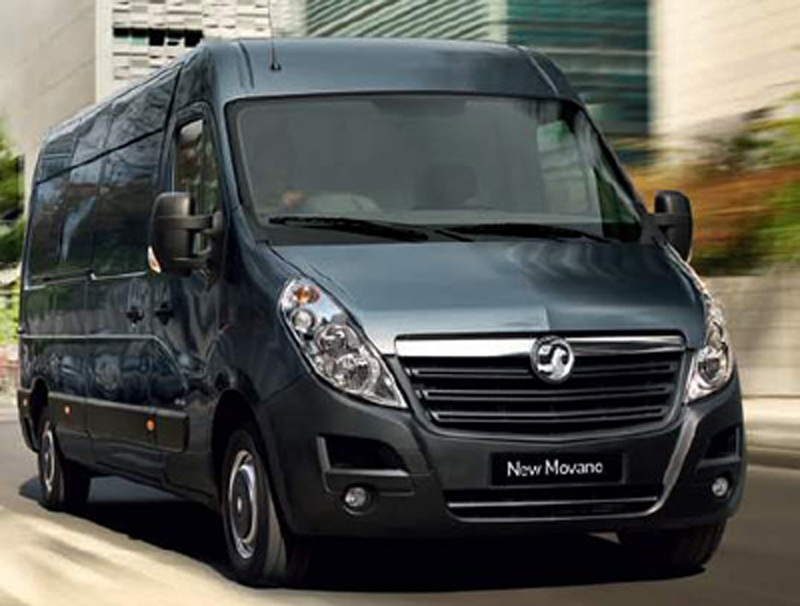 There are other options available on Movano, such as air-conditioning, satellite navigation, special comfort seats and even an air-suspended drivers seat as well of course as the hateful ‘digital tachograph’ that’s going to control your every move. Looking at business end of the van, load lengths can vary between 3038mm up to 4383mm depending on the model. Load width (between the wheel arches) is consistent at 1380mm on the front wheel drive and rear wheel drive versions, unless you choose the HD version in which case, the width narrows to 1080mm. All Movano’s come with a side loading door giving a load aperture of 1270mm which means you can get a Euro pallet in sideways through the SLD. The rear doors have a 1577mm loading width and can be opened 180 degrees, giving easy access for fork trucks and the like. Payloads range from 1176kg to 1610kg, but if you want to go bigger than 3500kg and run a tachograph, the 450 version will allow you to carry up to 2254kg, depending on model. The Movano requires a service every 25,000 miles or every year (which ever comes sooner) and gets a 3year 100,000 mile warranty (again, which ever comes first), although the first years warranty is unlimited mileage. Pricing starts at a little over £20,000 for the L2 H2 with the 100ps engine, up to a touch over £29,500 for the 450 with the 150ps Euro5 engine and that’s fairly in line with its competition, but as we all know it’s a hard market out there in van-land and its very unlikely that these are the prices you would actually pay. We ran the Movano both unloaded and loaded and whilst for sure, you could tell the difference, our test vehicle only had the 100ps engine and we were mighty impressed by its performance in all conditions. Companies buy vans to do a job and in most cases, the person that places the order will never ever drive the van and chances are they might not never even see it, and so because of that, I am glad manufacturers like Vauxhall are building vans that offer such a high standard level of specification as the person driving it is going to spend ages behind the wheel and needs to enjoy or at least be able to tolerate being there, as we expect them to stay alert, motivated and to be safe, for all the rest of us. Having said all that, the market for vans of this type us huge and its also full of manufacturers offering alternative products and indeed, the Movano has a couple of brothers, the Renault Master and the Nissan Interstar, which are bodily pretty much the same vehicles (indeed we noticed the electric box beside the interior light on our Vauxhall had Renault written on it). Citroen & Peugeot offer Relay and Boxer which fit the Vauxhalls profile and of course Mercedes is also a major player in this market and you can’t think big van without thinking of the ubiquitous Ford Transit which is so many users van of choice. We genuinely enjoyed our time with the Vauxhall Movano and it’s a proper van. Despite the enormous size of the test van Vauxhall sent us, the Movano was as easy to drive as a car. Its comfortable, well specified, has a good strong engine and a gearbox that even loaded and even in the lowest power output, didn’t feel it was tearing itself apart. As we said earlier, this is a huge market with some very good manufacturers offering products in this sector and for many buyers, once they’ve figured out the weights and sizes, price is going to become the major criteria, with access to a servicing dealer probably next on the list.